Do you ever feel like you are in a scary movie? I took this picture in Cape Town, South Africa. And Hitchcock’s movie, The Birds, was going through my head. This entry was posted in Africa, Travel, Travel Photos and tagged Africa, Alfred Hitchcock, Birds, Cape Town, Cities, Nature, Photography, Photos, Pigeons, South Africa, The Birds, Travel, Travel Blog, Travel Journal, Travel Photo, Travel Photos, Wildlife. Bookmark the permalink. Very Hitchcock – i’m glad they weren’t flying over my head! Yes…fortunately for me, I was higher up and looking down on them. Yes. But I hadn’t a chance to take their pictures… You did great shot dear TBM, what’s going on there 🙂 There is a man on the left wearing orange clothes… As if he is there to fight with them. I don’t know who the man is, but there were tourists feeding the pigeons and then they took off. I don’t think anyone was going to fight with them. Thank you Nia. And congrats to you! Hopefully they come in peace. Oooh that makes me want to watch that movie. I haven’t seen it since I was a kid, and I often I wonder if I would still find it scary? I don’t want to ruin the film by watching it again…maybe it will still be scary, but I think today we are used to cooler special effects. I could be wrong though. I totally agree. I usually end up laughing at the older movies now and wondering how I was ever scared! I can certainly see why you were so inspired! I was at Trafalgar Square on Saturday. Didn’t see too many pigeons, but a lot of tourists. A lot of them. I actually thought The Birds WAS a scary movie but when it was on tv 30 years later my girls just laughed all the way through it – EVERYthing changes, even fright and humour. I fear if I watch it again I would react like your girls. I think it is best to just remember its scary factor and not ruin it. It’s all a bit eerie isn’t it. Great shot though. Hope you were staying somewhere nice! Yikes! Throw some bread crumbs! Is it wrong that even though Finding Nemo had a bunch of seagulls yelling, “Mine, mine, mine!” I can hear these little guys doing it, too? I would be more nervous of the droppings falling on my head. Looks like an umbrella is needed. Great shot! Nice click, the pigeons (is it so?) look amazing? You are correct, they are pigeons. Thanks! I hope they were unscathed. funny I do the same thing… anytime there are a slew of birds I think of that movie. It looks so surreal with the birds… what an awesome shot. Great shot. Flying high on two accounts. It would seem that many people have pigeon phobia! I really enjoy all the movement and life in this photograph, T.B. It is so alive! Thanks for the kind compliment. It means a lot! When I saw it, I didn’t think ‘scary’ I thought ‘alive’. 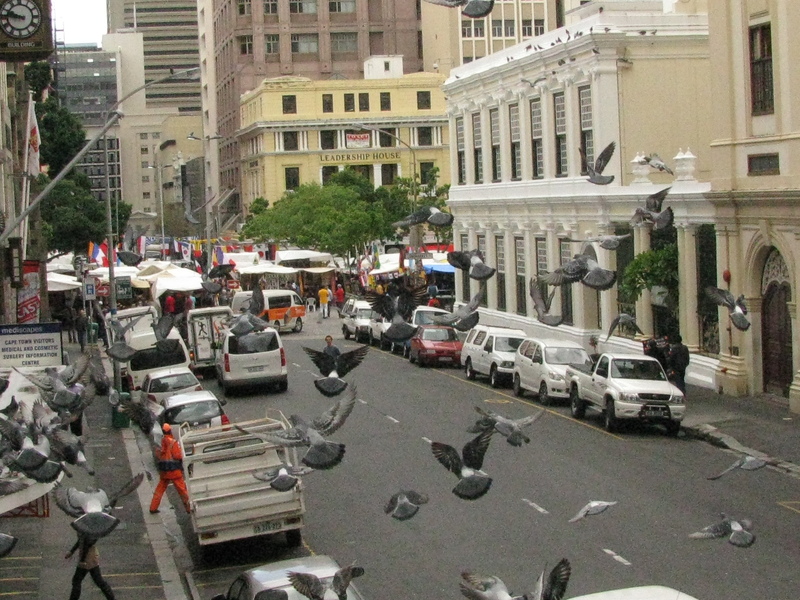 I like the scattering of birds in the foreground against the solidity of the buildings and the (mostly) stationary cars. Alive is a great way to put it! Birds in mid-flight. Nicely caught! That’s kinda funny. I hope it never happens to you.